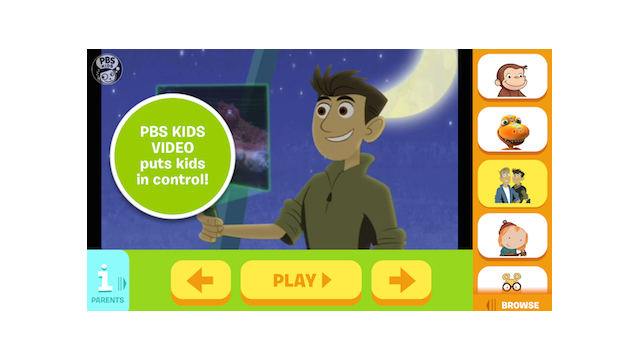 Arlington, VA, June 24, 2014 – PBS KIDS announced today that its popular video app is now available on Android and compatible with Chromecast; the app is the first children’s offering available on Chromecast. The PBS KIDS Video App gives families free, streaming access to thousands of videos, including clips and full episodes from their favorite PBS KIDS series. As children continue to stream videos on increasingly varied platforms, PBS KIDS’ offering on Android and Chromecast makes it easy for more families to access programming from the number-one kids’ educational media brand. With a cross-platform approach, PBS KIDS is increasingly serving children and families across America, wherever they live, learn and play, with content that is proven to help kids build key skills for success in school and in life. Chromecast offers families a new, easy way to watch video from the PBS KIDS Video App on their home TV screens. To start streaming, users simply plug Chromecast into their TV, connect it to WiFi, then press the cast icon to cast videos and more from the PBS KIDS Video App to their TV. PBS KIDS Video provides free access to videos from series such as PEG + CAT, SESAME STREET, THE CAT IN THE HAT KNOWS A LOT ABOUT THAT!, DINOSAUR TRAIN, CURIOUS GEORGE, DANIEL TIGER’S NEIGHBORHOOD and WILD KRATTS. Videos are updated weekly. The PBS KIDS Video App is available for free in the Google Play store, Amazon App Store, and the App Store on iPad, iPhone or iPod touch. More information is available at: http://pbskids.org/apps/pbs-kids-video.html. In addition to the PBS KIDS Video App and Chromecast, PBS KIDS offers free streaming access to its trusted educational content on Kidscreen- and Webby-award-winning pbskids.org, Apple TV and the PBS KIDS Roku channel. Images and other press materials from PBS KIDS are available on PBS PressRoom.